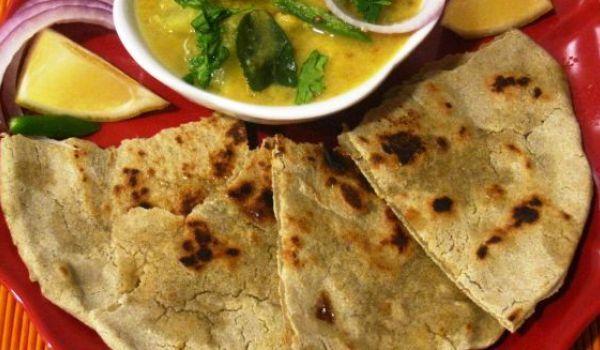 A must on the menu in any Rajasthani meal, the Bajra Roti unlike any other Indian flat breads is made of millet flour and drizzled with ghee to give it that gluttonous touch. Sieve the millet flour and add salt to it. Gradually add enough warm water and knead with greased palms to make a semi-soft dough. Knead the dough 5 minutes before making the roti. Divide the dough equally into lemon-sized portions. Flatten each portion with palms pressing the edges together to make 5 - 6 inch diameter discs. Heat a griddle at high flame and put a roti on it and roast both sides. Then put it directly on a coal fire to make it crisp. Smear 2 tbsp ghee on it, crumple lightly between both palms and serve hot. Repeat with the other rotis. Serve immediately with yoghurt or garlic chutney. When I make it why does it crack and break on the tava?